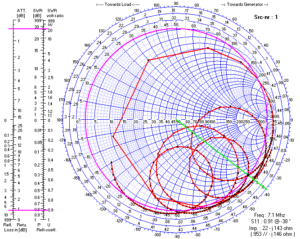 Above is the impedance measurement plotted on a Smith chart. This is more useful and very meaningful as an interactive display in Antscope where are you move the cursor, the frequency and key data are displayed. 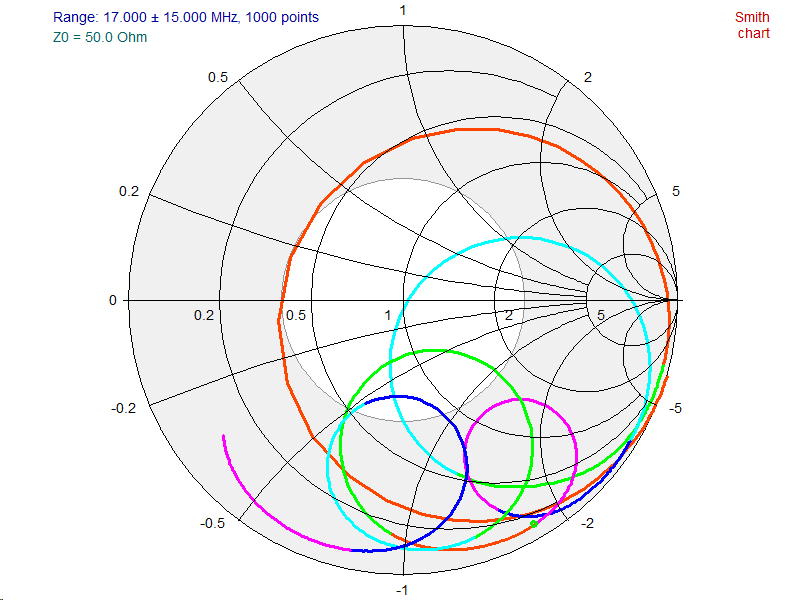 This broadly follows the expectation from a NEC-4.2 model that includes lossless approximations for the main transmission line, the balun and short 50Ω fly lead. 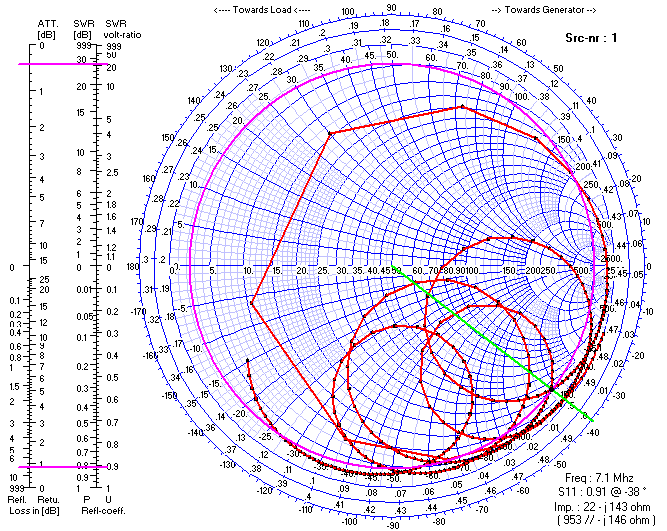 Above is a Smith chart plot of the NEC input impedance over the same 2-32MHz range. The impedances on some bands are towards extreme, they would be well beyond the capability of most internal ATUs, but can be matched easily and reasonably efficiently with a good T match. Above is a plot of R,X,|Z| for the same data. 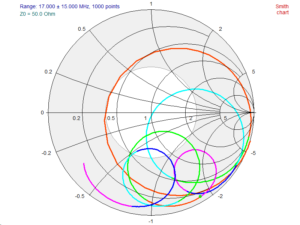 One of the shortcomings of Antscope is that it is not possible to disable the |Z| trace which seems to be there for appeal to so many hams who think of impedance as a DC like quantity (ie scalar). 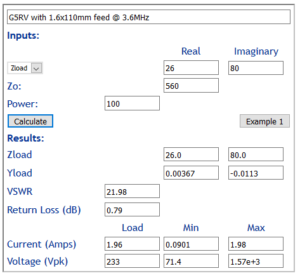 The impedance measurement was at the ATU terminals essentially, and the voltage on the load side of the balun is of greatest interest in this scenario. 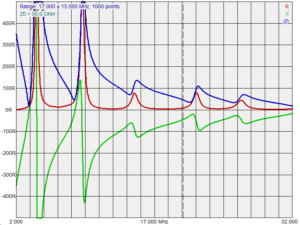 The impedance measurement was adjusted to back out the 500mm RG-400 tail and 0.995m, vf=0.75 of 113Ω line in the balun. Above is a calculation of voltage and current at the load side of the balun at 3.6MHz. 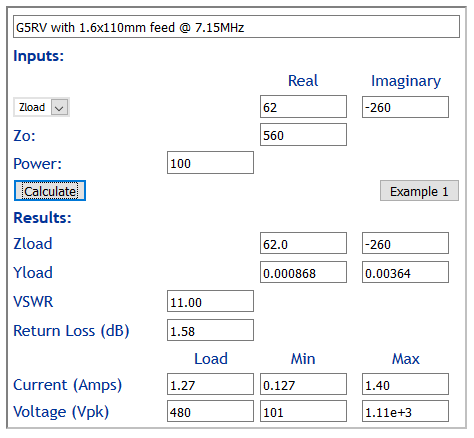 It can be seen that at 100W, peak voltage is fairly low. 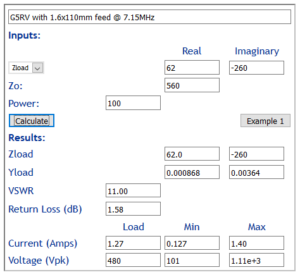 Above is the same calculation for 7.15MHz, voltage is a little higher but still quite manageable. 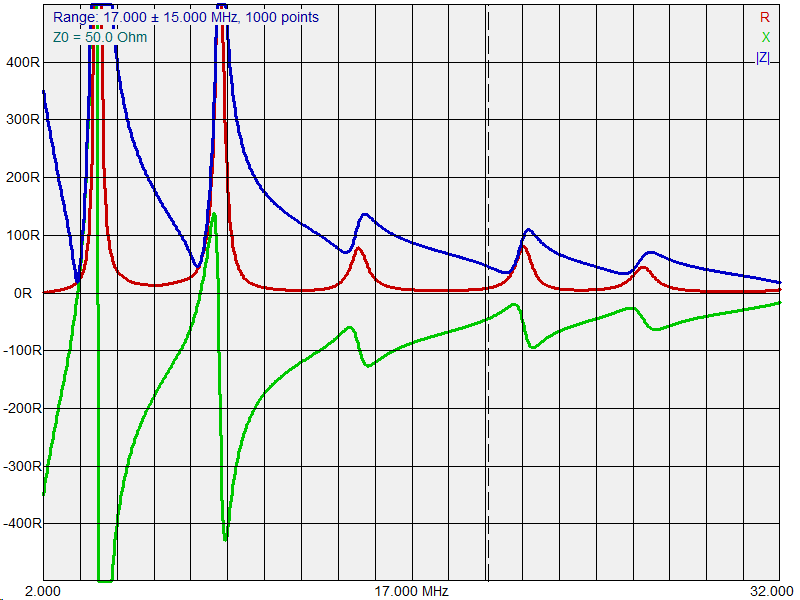 On the lower bands, the line sections are electrically short and the ATU voltage will not be greatly different.